So, baby is almost 6 months old which made me feel okay about wandering out to my first quilt guild meeting (ever) last night. The official name? Philadelphia Modern Quilt Guild. I am not usually a “joiner” of things. Driving there I wondered why that was. Then it was show and tell time. I was instantly reminded of my stage fright. The tunnel vision, the rambling, the general discomfort of standing in front of more than 3 people and talking. (I eloped for just this reason.) I rambled on and on, asked questions without waiting for answers and literally flashed the front and back of 2 quilts before I ran to my seat. It. Was. Embarrassing. I even had a nightmare about it last night. I mean really, why was I so scared of talking to a bunch of really nice quilting ladies. But I did it. And the ladies all seem very nice and I fear that I will never find the time to do the little monthly projects but, having goals is nice, so there you go. 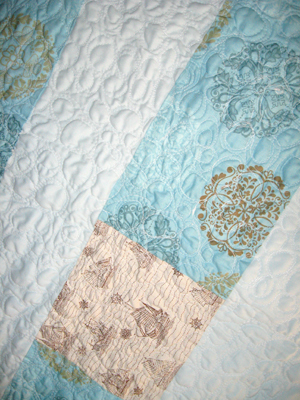 Since I can hardly get the laundry done these days I showed a quilt I made for hubby for Valentines day of *ahm* 2009. Which I have never shown blog land because, well… it is very far from being done. Pebbling is harder than I thought. 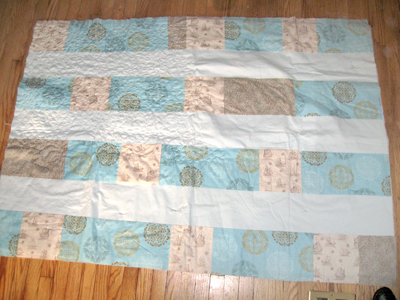 And I am kind of stumped on the binding. And well, I don’t know- once I missed the deadline I lost steam. The applique boats were drawn by my husband to the very specific shapes. One is his, one is is brother’s, one is his dad’s. 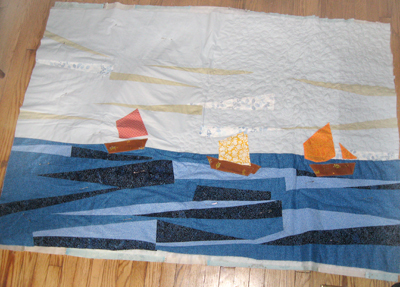 They build boats, I make quilts about their boats. Pebbling? Hard for anyone else? break lots of needles like me? I love the result, but it makes me want to tear my hair out. And don’t you think I should add some fluffy clouds to the top on the front? hummmm…. I loved seeing this quilt in person yesterday! I also enjoyed seeing your ribbon binding on the pink/green quilt. It was great to meet you and the many other quilters in this guild. I honestly didn’t even notice that you were stage freight! Thanks angie! It is great to connect to people who quilt, I look forward to more meetings. Also,it is good to know you didn’t notice my twitchiness- Hopefully it will be easier next time! I always feel the exact same way when i’m in front of people! But believe me, you were nowhere near as bad as you think you were and I really enjoyed talking with you. Glad you came! Start small, set weekly goals…that’s what I do. Sometimes I accomplish my goal…sometimes it takes 2 or 3 weeks. Oh and the stage fright…I couldn’t tell! It might have to make it back to the top of the WIP stack, thanks for the support!